Oklahoma quarterback Baker Mayfield and wide receiver Dede Westbrook were two of 18 players named Monday as semifinalists for the 2016 Maxwell Award, given by the Maxwell Football Club to the college football player of the year. Mayfield and Westbrook are two of the three semifinalists from the Big 12 Conference (Texas Tech quarterback Patrick Mahomes is the other). OU is one of just two teams with multiple Maxwell Award semifinalists (defensive end Jonathan Allen and quarterback Jalen Hurts also made the list from Alabama). 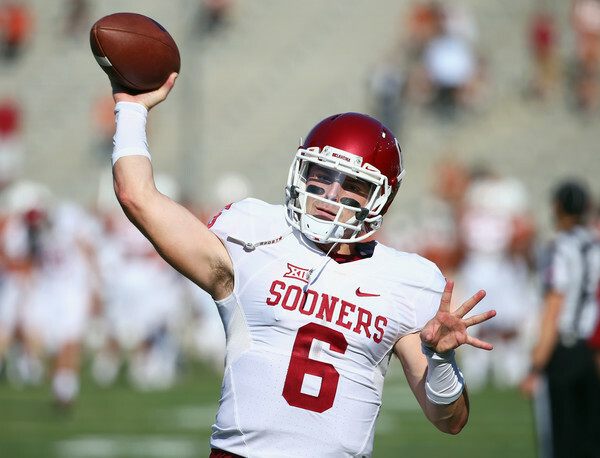 This marks the second straight year Mayfield has been named a semifinalist for the award. The redshirt junior from Austin, Texas, leads the nation in pass efficiency rating (195.8; the NCAA single-season record is 191.8) and yards per pass attempt (10.9; only one other player is above 10.0), and ranks second in yards per pass completion (15.4), fifth in passing touchdowns (27) and completion percentage (.709), sixth in points responsible for per game (23.0) and eighth in passing yards per contest (323.0). Mayfield has been even more impressive in OU's five conference games, leading the league in passing TDs (20; Mahomes ranks second with 14), completion percentage (.743; Mahomes is next at .659) and pass efficiency rating (212.8; Baylor's Seth Russell ranks second at 157.2). He has thrown for 358.2 yards per league contest and has also run for 135 yards and three scores during the stretch. Over the last three games, Mayfield has 15 passing touchdowns (a school record for a three-game stretch) against just one interception. Westbrook, a senior from Cameron, Texas, who was slowed by a hamstring injury in OU's first three games this season, is coming off the best statistical receiving month in program history. In five October games, all wins, Westbrook amassed 40 catches for 881 yards and 11 touchdowns, and also returned a punt 71 yards for a score Saturday against Kansas. The 881 yards and 11 receiving TDs are the most ever by a Sooner in a five-game stretch. Westbrook's 11 receiving touchdowns have averaged 45.6 yards, and eight of them have gone for 40 yards or more. His 11 TD catches over the last five games are more than 38 teams (18 Power 5 squads) have on the season. No FBS player has more receiving TDs on the entire year than Westbrook has in the last five outings, and his nine catches of at least 40 yards (all in the last five games) are more than 96 teams have on the season. In Big 12 play, Westbrook ranks first in the conference in receptions (8.0 per game), receiving yards (176.2 per game), points (14.8 per game), and all-purpose yards (210.4 per game). His 176.2 receiving yards per Big 12 game are 60 more than the next closest player (Texas Tech's Jonathan Giles; 116.2) and 85 more than the No. 3 player (Oklahoma State's James Washington; 91.6). Semifinalist voting for the Maxwell Award will begin Nov. 1 and will close Nov. 21. Three finalists will be announced Nov. 22, and a second round of voting will take place at that time. Eligible voters include Maxwell Football Club members, NCAA head football coaches, sports information directors and selected national media. The winner of the 80th Maxwell Award will be announced as part of the Home Depot College Football Awards Show, which will be broadcast live on ESPN on Dec. 8. Past OU winners are Tommy McDonald in 1956 and Jason White in 2004. No. 12/11 Oklahoma (6-2 overall, 5-0 Big 12) is in sole possession of first place in the conference race. The Sooners play at Iowa State on Thursday at 6:30 p.m. CT. The game will be televised by ESPN.